EverGreen Recreational Vehicles, LLC has reinvented the Toy Hauler travel trailer with its 2014 Amped series. Five new Amped floor plans—from 22 to 32 feet—feature EverGreen’s exclusive Z Frame Technology that results in a step-up forward bedroom to allow under-floor storage found only in large fifth-wheels. In addition to basement storage up front, the innovative frame on the new Amped toy hauler is set above the axles eliminating cumbersome wheel wells inside the payload area. 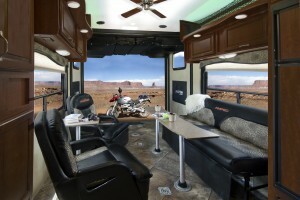 This allows increased, wall-to-wall loading space for ATVs, side-by-sides and motorcycles without awkward wheel wells. The new Amped toy hauler also features a standard eight-foot beavertail ramp, 3,000-pound capacity ramp door and EverGreen’s exclusive impact-resistant, vacuum-laminated ComposiTek™ interior walls. Z frame technology allows for huge trunk space and pass-through basement storage. In addition, the raised bedroom has more storage under the queen-sized bed and in two large wardrobes with drawers. Large storage doors drop down for easy loading and close with slam latches. Z-Frame technology provides additional space for a standard 4,000-watt Onan generator and a lockable, large 4-battery capacity power compartment without compromising living space. The Amped is ramped with standard beavertail. The standard beavertail on all Amped trailers makes loading and off-loading easier. Amped also has a full, eight-foot, 3,000-pound capacity ramp. A built-in toolbox is flush to the floor on all models. The entire floor of Amped toy haulers is engineered with marine grade plywood. D-ring tie downs are bolted to the frame. Load Amped to the max—no interior wheel wells! The Amped Z Frame Technology results in the floor system set over the axles eliminating cumbersome wheel wells inside the payload area. This allows more room side-to-side for easier loading and unloading. More ground clearance. Setting the frame over the axles provides higher ground clearance off road. Standard Equa-Flex™ suspension provides added stability and can adjust to the terrain. Standard 16-inch tires help improve the ride. ComposiTek interior walls for more durability. Amped toy hauler interior walls are built with a tough Composite Inner Shell vacuum laminated to the EverGreen’s signature DuraLite™ Double Welded Aluminum structure. Composites in the interior walls resist moisture, rot and mildew. Vacuum lamination and one-piece composite walls are stiffer and have a white, gel-coated exterior finish.